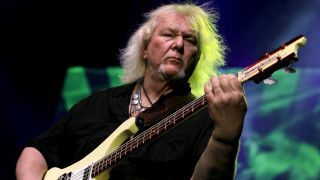 Chris Squire, bass player for legendary prog band Yes, has passed away aged 67 in Phoenix, Arizona. The bassist was diagnosed with acute erythroid leukaemia in May, a condition for which he was receiving treatment up until his passing on 27 June. Squire was known for his melodic bass playing and distinctive Rickenbacker growl - he was the only member of Yes to perform on all of the band's albums, after founding the group in 1968. The band issued the following statement on Squire's death: "It's with the heaviest of hearts and unbearable sadness that we must inform you of the passing of our dear friend and Yes co-founder, Chris Squire. "Chris peacefully passed away last night (27 June 2015) in Phoenix, Arizona." We were lucky enough to catch up with Chris in 2012, when he discussed his long career with Yes, his relationship with Rickenbacker and more.